The Labour right's summer of slander is drawing to a close. As parliament reopens and the party's conference approaches, the Blairite fifth column is preparing the next phase in its relentless anti-Corbyn campaign. Right-wing MPs are anxiously weighing up their options. They are considering possible scenarios and reflecting on which lines of attack have thus far proved most fruitful. There will be no respite for Corbyn. The key question being discussed by his enemies is what comes next: how can they best escalate the attacks, how can they inflict the maximum possible damage? In an attempt to provide answers to these questions, Tony Blair has taken to the airwaves to publicly ruminate on possible strategies for his acolytes. In the same week that he took part in an apparently 'friendly' meeting with the far-right Italian interior minister Salvini, in which he deputised on behalf of his current client - the dictatorial government of Azerbaijan, Blair had the astonishing audacity to take part in a lengthy interview with the BBC's Nick Robinson in which he bemoans the rise of 'extremism'. The so-called extremism worrying him is evidently not that of the far right. Salvini's plan to hold a special census of the country's migrant and Roma populations, with the supposed aim of determining whether people are 'real' Italians, has been compared with anti-Jewish laws of the 1930s. Yet Salvini appears perfectly palatable to Blair. No, his concerns are closer to home. It is Corbyn in the firing line. Blair's interview with Nick Robinson provides a revealing glimpse of what's really motivating the anti-Corbyn campaign. 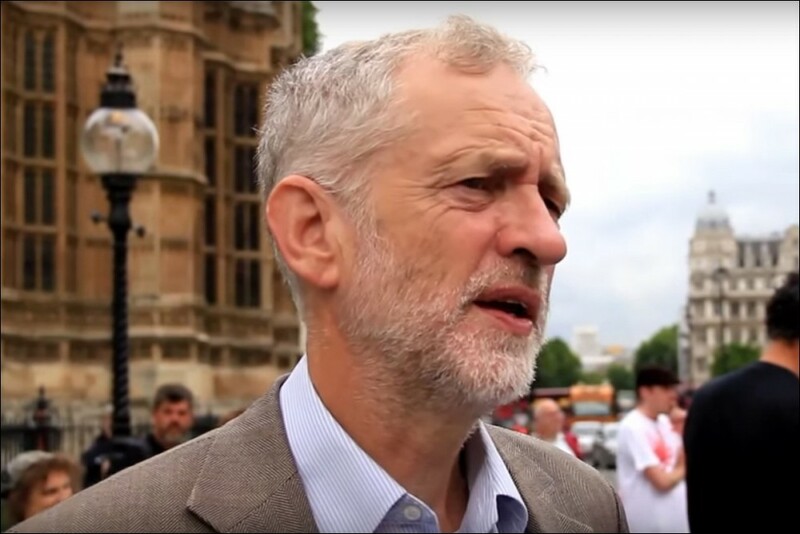 Gone are the days when the issue of 'electability' was used as a smokescreen to mask the real, fundamental political differences separating Corbyn and his supporters from the Blairite majority in the parliamentary Labour Party. In this interview Blair openly describes his dread at the prospect of both leaving the EU and the potential election of a Corbyn-led government. "Can it be taken back? I don't know" was his widely reported answer to the question of whether he believed the right could succeed in 'reclaiming' the Labour party. This answer confirmed what has already been reported as being discussed by a core group of Blairite MPs: the possibility of a right-wing breakaway. The potential launch of a new party was a subject revisited throughout the interview, with Blair effectively confirming it as an option under serious consideration. Indeed, it is Blair's own ex-chief of staff who is reported to be heading up discussions among right-wing MPs. But a new party is only one possible course of action for the Blairites. Even if it were implemented imminently, it would likely be part of a combined approach. Whether to protect their individual careerist ambitions, or with the conscious aim of acting as rear-guard saboteurs, or for a combination of these two reasons - it would be likely that many, probably most, anti-Corbyn MPs would remain in Labour in such a scenario. Their purpose in staying behind would be to continue to act as agents of the capitalist class, attempting to block Corbyn's pro-working class policies. Discussions about MPs going so far as to stop Corbyn from becoming prime minister following a potential Labour election victory have already been reported. Whether they would be so bold as to act in this way - a move that would immediately provoke mass anger among working class people - remains to be seen. What is certain, however, is that if their strategies for preventing a Corbyn-led government fail, they will take the road of sabotage. Faced with this ongoing situation, what should be the attitude of Corbyn, McDonnell and the leadership of Momentum? Up until now, their approach has been to cede ground to the right in the hope of preserving a false 'unity' with the Blairites. The latest example of this strategy in action was the adoption by the national executive committee (NEC), on 4 September, of all the illustrative examples attached to the International Holocaust Remembrance Alliance (IHRA) definition of antisemitism. These, particularly those which deal with Israel, have the potential to become a pretext for disciplinary cases against large numbers of Corbyn supporters. (See 'Antisemitism smears against Corbyn are battering ram of the right'). 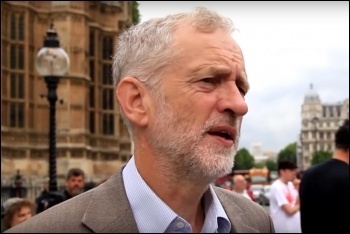 It has been reported that Corbyn brought a statement of clarification to the NEC meeting which was designed to try and prevent attempts to restrict discussion on the Israel-Palestine conflict. This clarification was blocked, however, despite the NEC's supposed left majority. In the end, a short and mildly worded clarification was agreed. Far from placating the right, this retreat has only served to embolden them. The same pattern has been seen throughout Corbyn's leadership. Every concession granted to the right invites them to demand another. The sustained smear campaign that Corbyn has been subjected to over the summer has not abated. The veteran Blairite Margaret Hodge was the most blunt in describing what this is really about when she spoke on 2 September: "The problem is that he is the problem... Corbyn has only been there for three [years] - three damaging years". Even after the NEC adopted the IHRA examples two days later, Hodge continued her offensive. This time, she saw fit to attack the leader for the crime of raising for discussion his 'clarification': "Two steps forward one step back" was the way she put it on Twitter. Chuka Umunna also provoked outrage when he likened Corbyn supporters to "dogs". Gavin Shuker, an ultra-Blairite, was charged with the task of digging the knife into Corbyn on Newsnight the same evening. He used the opportunity to again hint at the prospect of a new party: "I think it's increasingly difficult not just for me but for other colleagues" to remain in the Labour Party, he threatened. Ordinary members of his local constituency Labour Party (CLP) clearly agree. On 6 September, the CLP passed a motion of no confidence in Shuker. This followed on from a similar motion being passed in Enfield North, the constituency of Shuker's fellow Blairite MP: Joan Ryan. These no-confidence votes are an important symbolic indication of the mood of ordinary Labour members and Corbyn supporters. No-confidence votes have no real power in and of themselves. But they must be the starting gun for the battle to deselect the pro-capitalist Labour saboteurs. In particular, it is vital that Corbyn comes out clearly and boldly in favour of mandatory reselection of MPs ahead of a vote on the question at the upcoming Labour Party conference. On 11 September, John McDonnell commented that his preference was for the party to maintain its current 'trigger ballot' system. This approach is mistaken. 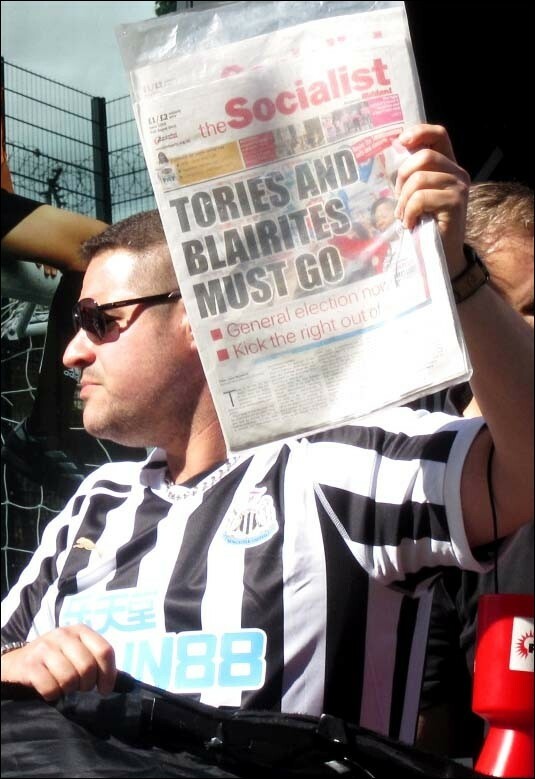 There must then be a huge campaign, drawing into activity the vast majority of Corbyn supporters who want to fight the right, in order to deselect right-wing MPs - replacing them with fighters for the working class. Under the pressure of such a campaign, it is possible that many right wingers, following in the footsteps of Frank Field, could jump before they are pushed. But this should not be seen as a reason for the left to hold back. 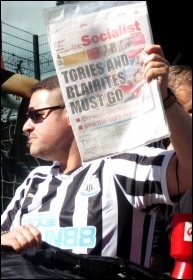 Even if taking on the Blairites in this way meant Labour being temporarily weakened in parliament, if the party were freed from the stranglehold of the right to put forward clear, unmuffled pro-working class and socialist policies, this could lay the foundation for Labour to win mass support among the population - support going far deeper than that which already exists for Corbyn. Part of taking on the right must mean opening up the Labour Party to all anti-austerity, pro-worker forces. A spectre that seemingly hangs over Blair, and which he repeatedly references in his BBC interview, is that of the Militant tendency - forerunner to the Socialist Party. What makes the Socialist Party a 'bogeyman' for the right is our implacable determination to fight in the interests of working class people. 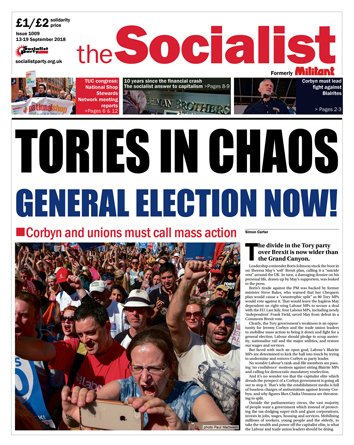 That's why we call for the Labour Party to adopt a modern federal structure - which could allow the participation of all pro-working class forces, including the Socialist Party - as part of a full programme to redemocratise the Labour Party, restoring trade union rights, and refounding the party along democratic, socialist lines.